Ahh politics. I have missed you. In the past few weeks as I have been following the Wake County School Board drama, I was reminded of how getting involved makes me feel. I realize that everything isn’t about me, but things DO affect me. And I have thoughts. And opinions. I used to be very outspoken about my opinions. Probably obnoxious (ask my roommates from during the 2000 Presidential Election debacle and they will tell you it was Chris Matthews all day all the time for me!) but at least I was dedicated. 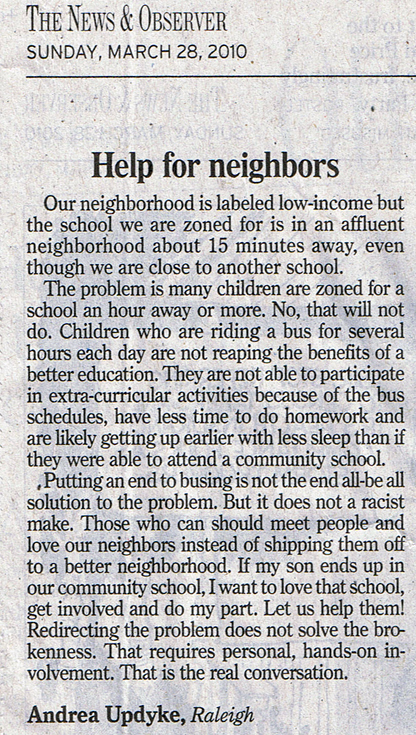 This week I wrote my first ever Letter to the Editor. And it was published at the very top of the Editorial page of the Sunday paper! I don’t know why I got so excited about it. But I felt heard. SOMEONE listened. And then I realized, that I finally got squeaky. And it’s been a long time since I made any noise. My degree is in Political Science (International Affairs) and I chose it because I am genuinely interested in the world around me. I think I “get” certain things about the political landscape that are somewhat shocking to a lot of people (like political game play and how e.v.e.r.y.o.n.e. does it. period.) And if I am honest, the game play is part of the appeal. Which is also shocking to some, especially when we are talking about people’s livelihood. But it’s an important piece of the puzzle because once you get that, you can move on and just work with the system to bring change. And as they say, Rome wasn’t built in a day. When I decided not to move away 5 years ago, or pursue a career on the International stage, I think I threw the baby out with the bathwater. I stopped following politics (international and otherwise) so closely and kept my opinions to myself. But as with everything else in my life after having a baby, I feel those clipped wings starting to grow again. Only this time, I am finally free to get involved locally. I have roots and weight behind my voice. I can’t explain why really, as I am pretty sure my voice always mattered. But for some reason I am no longer ashamed to have an opinion. I do prefer diplomacy to debate and that has always been true. If I sense you are a die hard (blue state or red) I am going to try and pull you to the middle. That’s just what I do. But I’m not gonna lie. I am excited to get back on this bike and I hope I can do some good in my community. As a result, you might see my opinions pop up more around here as I decide what they are. And if you agree or disagree, I would love to hear about it. Congrats on being published! I am interested to see how the time away – growing up more, becoming a mother, homeowner, everything else, enhances your interest in and response to politics. Amy I am with you on this one! For a while though I wondered what the point was – especially in seemingly pointless (read:endless) debate. But you are right, this is what we have. And as a mother, my interest in Local policy has quadrupled at least. I think for me, that will be my focus. I really want to concentrate on knowing my district, its representatives and everyone I need to talk to about change. It really does start from the ground up!